Unlimited Timothy Hay (however much they want; it should constantly be in their cage). Only give occasional snacks of alfalfa hay (unless they are under 6 months, then you give them as much Alfalfa as they want along with Timothy hay). Constant source of water from water bottle (better) or water bowl (needs washed continually). For adults: 1/8 to ½ cup of pellets a day based on weight. The average is 1/4 cup of pellets per 5 pound bunny but can vary according to whether your bunny is underweight or overweight. - Timothy based pellets are best for adults. Alfalfa pellets for those below 6 months. - The best brands include Oxbow (the best quality) and Kaytee. - Do not use grocery store/chain store based pellets which involve too many extras like corn and other fatty foods. - Do not feed pellets with added nuts, seeds, and fruits. These are bad for rabbits and can cause gastric problems. - Give mainly vegetables, especially greens like parsley, spring and baby mixes, romaine, dandelion and radicchio, peppers, cucumbers, broccoli, radishes, etc. - Fruits and other sugary veggies like carrots can be fed sparingly (usually once or twice a week), including apples (cores removed, seeds are poisonous), berries, bananas etc. -Avoid cabbage, beans, iceberg lettuce, onions and any people food. Treats should be given minimally. 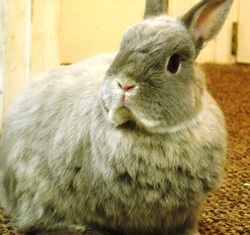 Stores bought treats with seeds, nuts, dried fruits and other additives can be very bad for rabbits. Stick with all natural, hay based treats that do not have ingredients you cannot pronounce. If you wouldn't eat it, don't give it to your bunny! As large as possible cage or indoor 4' x 4' puppy pen. Cages should have a solid plastic bottom to prevent foot sores caused by wire. -In cages, bedding should be black and white newspaper or some other sort of recycled newspaper. Wood based bedding is only okay if it is dust free Aspen. Pine and Cedar are proven to be poisonous to bunnies. Do not use cat litter as it can cause sickness. Rabbits will go to the bathroom where they eat so you can litter train a rabbit by putting their hay in or right near their litter box. All rabbits should be housed indoors for their health and safety! It is required by Judge’s Park and our animals will not be adopted out as outdoor pets! There are too many dangers outside including but not limited to: predators, fly strike (where maggots burrow into the rabbit's skin), temperature changes (which can cause sickness), etc. Rabbits must be spayed or neutered. Female rabbits have a very high risk of ovarian, uterine, and mammary cancer without being spayed, potentially cutting short their life by many years. There are behavioral issues as well. Rabbits, when unspayed or un-neutered are driven by their hormones which can cause rabbits to be very difficult animals to live with. They pee and poop everywhere, spray their urine, and possibly can become aggressive. When you neuter a male, all those territorial/breeding behaviors are eliminated or greatly reduced which makes them a wonderful, cuddly, housetrained pet. Females are, along with being healthier, are much calmer and more likely to be a friendly, housetrained companion. 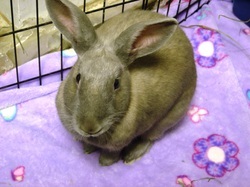 Though rabbits are not required to have shots, we recommend a yearly visit to the vet for a wellness check. Rabbits can hide their symptoms if they are sick, so watch closely for nasal discharge, issues breathing, sneezing, not eating or other signs that all is not well. If a rabbits stops eating they can die within 24 hours! Rabbits can get deadly gastric blockages so they must be watched closely and kept on a strict rabbit friendly diet. If they stop eating, take them to a vet ASAP!